The Ministry of Education, Culture, Sports, Science and Technology released the results of their “investigation about use of a child’s cellular phone” survey which was conducted late last year. With replies coming from a total of 10,448 people, ranging in age from elementary school through high school, it’s a wide ranging report with a significant amount of user data, all in Japanese. It’s a real eye-opener on mobile youth usage behavior so we cranked out a quick machine translation, to cover the key points, for you below. As for the possession situation of the cellular phone, in the sixth grader in an elementary school, 24.7%, the second-year student in a junior high school became 45.9%, and the eleventh grade student became 95.9%. The reason which came to have a cellular phone had most replies with “since the friend has” at the second-year student in a junior high school, or the eleventh grade student, while the user who the schoolchild answered was recommendation of a cram school, lessons, and a guardian became 40% or more. As for the duration of call per day, the reply with less than 10 minutes has accounted for 70 percent any layer, and “it hardly uses for a telephone call” is over 40 percent especially. On the other hand, a difference will be looked at by the number of average mails on the 1st. If the reply with less than ten affairs occupies about 75% and a schoolchild turns into a second-year student in a junior high school, it will become small at a little less than 40%. Instead, by the junior high school student, the user who exchanges 1 30 or more affair mail per day indicates the high result to be 30%. In the relation between a cellular phone and a bedtime hour, a result in which a bedtime hour is rash was brought as the child with little transceiver number of cases of e-mail. Although the result which should mention the use purpose of the Internet using a cellular phone especially by the sixth grader in an elementary school except an exchange of e-mail is not seen, if it becomes a second-year student in a junior high school While a result with expensive e-mail etc. is shown, the checks (17.2%) and those writing (13.8%) of others’ PUROFU or a blog are conspicuous for musical download 31.2%. Furthermore, by the eleventh grade student, use of the portable Internet was expanded in various scenes, and musical download showed the result in which the writing to 63.3% and them has as high others’ PUROFU and check of a blog as 52.6% 70.2%. Unlike other layers, public presentation (40.1%) of PUROFU and public presentation (35.5%) of the blog also showed remarkable growth. In addition, although guardians recognized in general to such children’s use purpose, about a high school student’s PUROFU or public presentation of the blog, the reply of the guardian of “thinking that my child opens to the public” became 13 – the level of 14%, and the gap with children was seen. About the rule of the cellular phone in a home, while there was a rule to which a schoolchild restricts prohibition of use of a network and use about 50% by the frequency where the second-year student in a junior high school is as high as about 40%, the eleventh grade student brought a result with which it is not filled to 15%. In the eleventh grade student, the reply to which it is supposed that the rule is not decided was conspicuous with 54%. The evaluation to a cellular phone is carrying out positive evaluation with as good an impression as the user who uses now, and the tendency also as a guardian for this to be the same was seen. As for the uneasiness which the children to a cellular phone bear, reception of an unsolicited junk e-mail or a chain mail and disclosure of personal information have obtained nearly six replies, and, subsequently the worries about a use charge continued. Moreover, unlike other layers, by the sixth grader in an elementary school, the harassment using e-mail, a telephone, etc. and the reply which worries about troubles, such as human relations, indicated the high result to be about 50 percent. However, about the trouble which actually arose, 62.9% of the sixth grader in an elementary school has answered “He has not suited a trouble in particular.” In the junior high school student whose child who can use e-mail and the Internet now increases, and the high school student, the trouble which it supposes “The chain mail has been sent” obtained nearly 60 results. 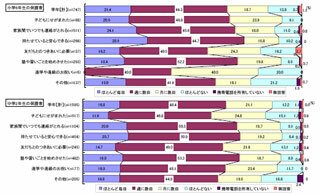 In addition, about the measure in schools, the elementary school which is tackling as the whole school became 17%, the junior high school became 55.3%, and the high school became 54.9%. The school which cooperates with a guardian and is tackling also shows the same numerical value. About the measure for which it will ask from now on, from the child side, every layer has obtained 50 percent or more of the reply, and, also in the opinion which asks for making Ruehl at a home, the opinion for which a harmful site is asked for strengthening of regulation exceeded 50 percent by the schoolchild. The guardian side had also obtained 70 percent of the reply to harmful site toughening of regulations, and also the reply of preparing the place which a child studies exceeded 60 percent. The result with a high reply also with the same school side was shown to the reply of such a child and a guardian. However, there were most replies which ask for an opportunity for a guardian to study about danger or notes, and they exceeded 80 percent in the elementary school and the junior high school.